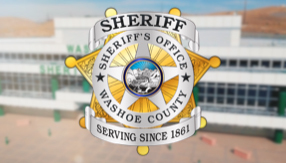 The Washoe County Sheriff's Office is an active partner in many Community events which provide a helping hand to those citizens who are struggling to provide for themselves. This is particularly true during the Thanksgiving and Christmas holidays. These holidays are especially difficult for families who cannot afford to buy food or presents. The Sheriff’s Office participates in the 4th Street Christmas On the Corridor Parade in partnership with the Reno Sparks Corridor Business Association. Candy, cookies, and toys are distributed to children in need who reside on the 4th, 5th and 6th Street corridors of Reno. The Washoe County Honorary Deputy Sheriff's Association holds an annual Shop with the Sheriff event. Volunteers from the Sheriff’s Office and the community are paired with children who are referred by a social service agency. The children are given a set amount of money to purchase items at Wal-Mart for themselves or members of their family. 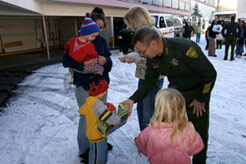 Each year, employees of the Sheriff’s Office adopt several families during Christmas. Employees purchase toys, household items, clothing, etc., at the families request and then deliver the gifts to the families prior to Christmas. A few days before Christmas, the Sheriff and volunteers from the Sheriff’s Community Work Program deliver goody bags to local children gathered at the Sun Valley Family Resource and Recreation Center. The bags contain gifts, candy, stuffed animals and warm hats.